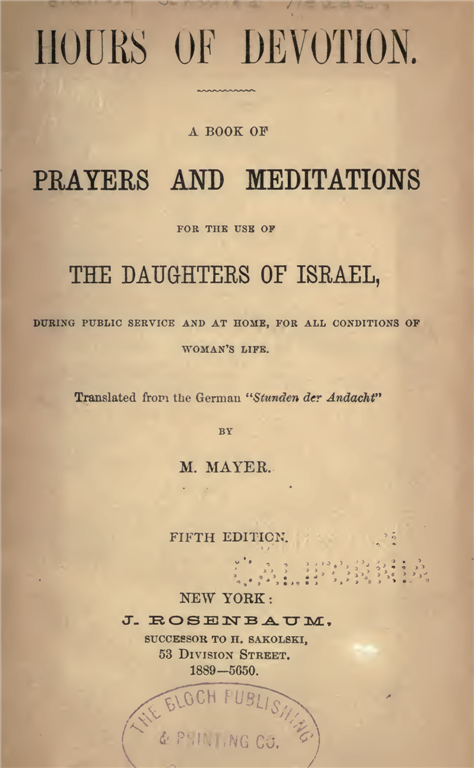 Stunden Der Andacht, Fanny Neuda (nèe Schmiedl)’s popular collection of prayers written in German and published in Prague in 1855 was already in its fifth printing a decade later when Rabbi Moritz Mayer published his English translation, Hours of Devotion (1866) in New York. Mayer, born 1821 in Dürckheim-on-the-Haardt, Germany, fled to the United States and to New York as a political refugee of the 1848 revolution. In 1856, after a five year stint as a rabbi in Charleston, South Carolina, he returned in poor health to New York where he contributed frequently to the Jewish press, and translated various German works into English: Rabbi Samuel Adler’s catechism, Abraham Geiger’s lectures on Jewish history, and Ludwig Philipson’s pamphlet, Haben die Juden Jesum Gekreuzigt? (the Crucifixion from the Jewish Point of View), et al.Cyrus Adler and Gotthard Deutsch, “Mayer, Moritz” in the Jewish Encyclopedia, 1916, as accessed August 24, 2011 In 1867, the year after Hours of Devotion was published, Moritz Mayer passed away. He was 45 years old. Mayer’s translation of Hours of Devotion contains sixty original translations of Neuda’s teḥinnot, as well as seven teḥinnot that are not from Neuda and which he may have composed himself. Teḥinnot in Hours of Devotion (1866) not translations of Neuda Page No. 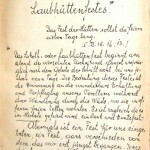 Below are the sixty translations made by Mayer with their corresponding page numbers and titles in Stunden Der Andacht and Hours of Devotion. Mein Gott und Herr! Du bist das Wesen der höchsten, reinsten und heiligsten Liebe und schauest aus jede fromme Liebe wohlgefällig nieder. Doch welches Gefühl der Liebe auf Erden ist wohl reiner und heiliger, als Kindesliebe! Du selbst hast sie geweihet, hast sie uns ans Herz und ins Herz gelegt, und uns geboten, zu ehren und zu ehrfürchten Vater und Mutter, auf daß wir lange leben auf Erd en.” Und für sie, diese Ebenbilder deiner grenzenlosen himmlischen Liebe auf Erden, ringet sich in dieser Stunde das kindlichste Gebet aus den Tiefen meines Herzens zu dir empor. Heavenly Father! Thou art the fountain head of the highest, purest and holiest love, and lookest graciously down upon all pious love. But what feeling of love on earth is purer and holier than that of children for their parents? Thou alone hast consecrated it, hast placed it into our hearts, and commanded us to honor and revere our father and mother, that our days may be long upon earth. And for them, the earthly representatives of Thine endless heavenly love, my fervent prayer now ascends unto Thee from the depth of my heart. Erhalte mir, Gott, meine Eltern, erhalte mir sie, die Schusengel meines Daseins, die Begründer meines Glückes, die größten Wohlthäter meines Lebens, denen ich so Vieles schulde, so Vieles verdanke! Sie haben mich gehegt und gepflegt, geführt und geleitet, haben für mich gewacht und gesorgt, gestrebt und gerungen, haben mit ihrem Herzblute mich auf und groß gezogen und mich gelehret, dich, o Gott, erkennen und mein Herz voll Vertrauen und Liebe zu dir zu erheben. An ihrer Hand bin ich durch die freundliche Jugendzeit, wie durch einen Garten der Wonne, voll weichen schwellenden Pfaden, voll duftiger Blumen und Blüthen, gewandelt, und jeder Dorn, jeder Stein des Anstoßes ward durch ihre Liebe und Sorgsamkeit aus meinem Wege geräumt. Bei ihnen fand ich stets den besten Trost, die zärtlichste Theilnahme in allen Ereignissen meines Lebens! Aber vergebens suche ich nach Worten, um vor dir das auszusprechen, was mir so heiß, so innig und inbrünstig das Herz bewegt. Doch du, mein Gott, schauest in des Gemüthes innerste Tiefe, zu dir spricht die verborgenste, geheimste Regung, zu dir, du Herzenskundiger, spricht jetzt meine Seele in ihrer glühendsten, sehnsuchtvollsten Sprache, und diese Sprache wird zu dir dringen, wenn auch mein Mund keine Worte findet, um sie zu dir empor zu senden. O, mögest du meinen Wünschen freundliche Erhörung und Gewährung angedeihen lassen, mögest du segnen die geliebten Eltern mit deinen besten, schönsten, reichsten Gaben, mit einem langen, fried- und freudenvollen Leben und sie beglücken mit aller Lust, mit aller Wonne des Daseins, mögest du ihr Alter ein frohes, kummer- und schmerzloses sein lassen, und all die heißen Wünsche, all die beglückenden Hoffnungen, die ihr liebend Elternherz erfüllen, mögest du, mein himmlischer Vater, durch uns, ihre Kinder, ihnen ins Leben treten lassen. אָמֵן Amen. O God! preserve my dear parents, preserve them unto me, these guardian-angels of mine existence, those founders of my happiness, the greatest benefactors of my life to whom, I owe so much, to whom I am indebted for so much. They have nursed me and attended to me, they have guided and taught me, they have watched and cared for me, they have labored and struggled for me, with their hearts’ blood, and raised me up and instructed me to know Thee, my God, and direct my heart to Thee in love and confidence. Led by their loving hands I passed through the bright time of infancy as through a beautiful fragrant garden, full of sweet blossoms and flowers,—every thorn and stone was removed from my paths by their love and solicitude. In all accidents of my life I found at all times the best consolation, the most tender sympathy with them. But I seek in vain to find words for the utterance of the ardent and profound emotions that move my heart. But Thou, O God, lookest into the inmost heart of man,—the most secret feeling speaks unto Thee, Thou Searcher of the inner parts, and that language will reach unto Thee, tho’ my mouth may find no words to carry them up to Thee. Oh! mayest Thou grant Thy gracious fulfillment and realization unto my wishes—mayest Thou bless my beloved parents with Thy best, most beautiful and richest gifts, with a long and peaceful life, and cheer them with all the joys and delights of earthly life; mayest Thou make their old age one full of gladdness, free from care and pain;—mayest Thou realize all the quickening hopes that fill their loving hearts, through us, their children. Oh! may this be Thy holy will Heavenly Father. אָמֵן Amen. Other English translations of Stunden Der Andacht exist. Dinah Berland’s new translation of Hours of Devotion was published by Schocken (Random House) in 2007. A good number of Neuda’s prayers were also beautifully translated by Kaeren Fish in Hebrew and English in Aliza Lavie’s Prayerbook for Jewish Women published by Random House in 2008. These translations remain copyright to their publishers, all rights reserved, and because these translations are not freely licensed or yet in the Public Domain, they are sadly not available for redistribution and creative reuse in new siddurim. (If you are a copyright owner of Jewish prayer or translations of prayer, please consider freely licensing your work with a Creative Commons free/libre attribution license: CC-BY-SA or CC-BY). Our intention for the Open Siddur Project is to make Fanny Neuda’s work and all Jewish prayers freely available for inclusion in new siddurim, machzorim, curricular material, etc. For the Open Siddur Project’s public database, I prepared a new digital edition of Hours of Devotion. For this edition, I used a high quality scan by the University of California libraries of the 1889 reprint of Mayer’s 1866 translation of the 5th edition of Stunden Der Andacht by J. Rosenbaum that had been contributed to the Internet Archive. In preparing this edition, I transcribed the text and formatted it in STML (Sacred Text Markup Language), a format developed by J.B. Hare z”l, founder of the Sacred Texts Internet Archive. Hare used STML as an intermediary format for converting transcribed texts to HTML. Efraim Feinstein, lead developer of the Open Siddur Project, further developed STML as an intermediary format for converting transcribed texts to JLPTEI, the XML schema we use to markup Jewish liturgy and liturgy-related work for the Open Siddur’s database. “Hours of Devotion: Fanny Neuda’s Stunden Der Andacht translated with additional prayers by Rabbi Moritz Mayer (1866)” is shared by Moritz Mayer (translation) with a Creative Commons Attribution-ShareAlike 4.0 International copyleft license. Please reciprocate for any adaptation or redistribution of this work by (1) properly attributing the work to Moritz Mayer (translation), Fanny Schmiedl-Neuda and Aharon N. Varady (transcription), (2) clearly indicating the date you accessed the resource and whether any changes have been made (and if so, please be in touch with us and leave a comment below so that we might note your adaptation or improvement), (3) providing a link back to this source, and (4) specifying the Creative Commons Attribution-ShareAlike (CC BY-SA) 4.0 International copyleft license under which this work was shared. 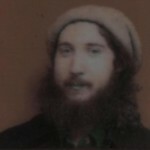 2011-09-04 – 6 Elul 5771 at 5:45 pm · Reply.